Hello again and HAPPY NEW YEAR! I hope you all have had a wonderful holiday season and are ready to get back to crafting these cold winter days away. Our challenge for this month is NEW TO YOU. 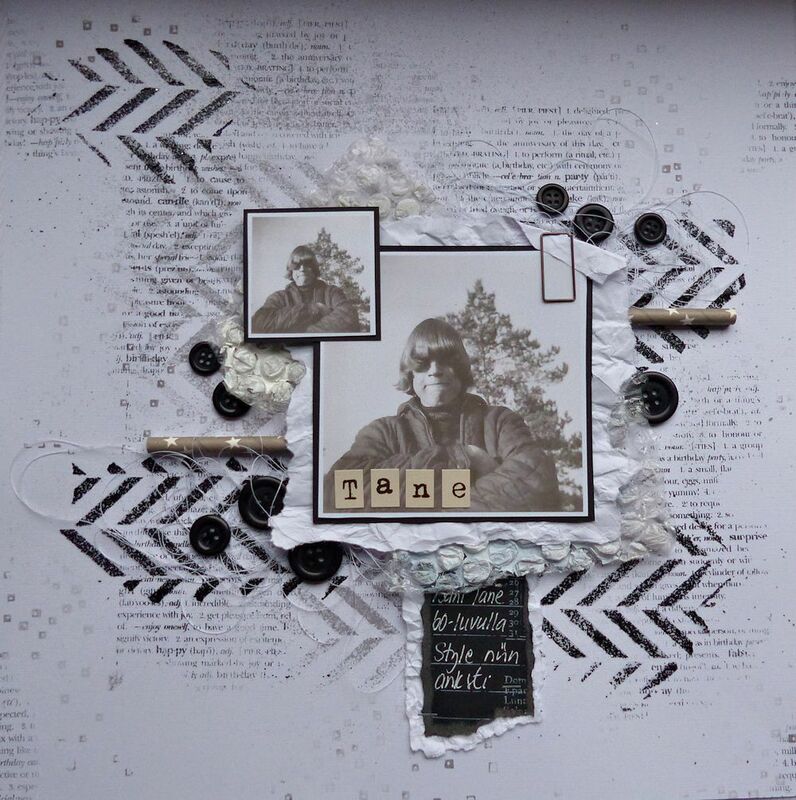 Use any Hero Arts HARD PRODUCT (Stencils, stamps, dies, embossing folders) to create a card with a product that is New to you! We can’t wait to see what you create. We have some inspiration for you. Aren’t they amazing? 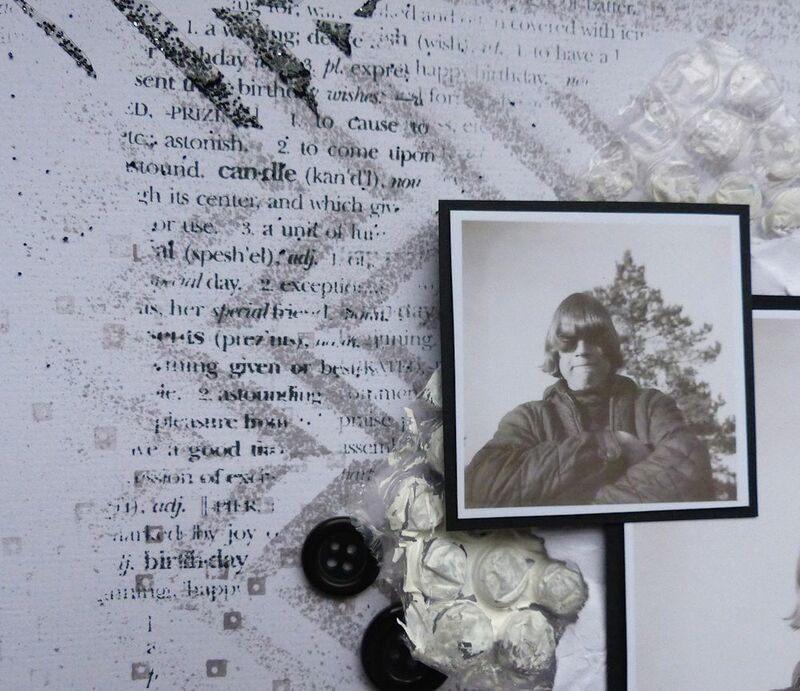 You have the whole month to create a new project and enter it into Mr. Linky below. 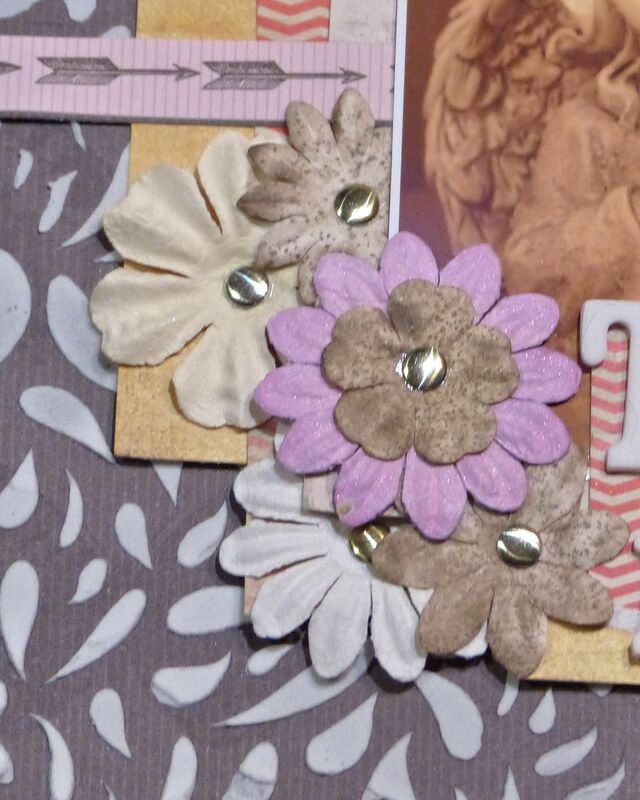 By entering you will be entered to win a $25 Gift Certificate to the a2z Scrapbooking store. Winners will be announced on the 16th of February. Good Luck! We can’t wait to see what you create! Hello everyone and HAPPY NEW YEAR! Can you believe that 2014 is over? This year flew by. I decided for today’s blog post that I wanted to go back over all the entries into the years challenges and upload some that really caught my eye. There were so many wonderful entries to our linky parties and challenges. We wouldn’t be here if it weren’t for YOU…our dedicated customers and readers. So today we are going backwards from November until May when it all started here. 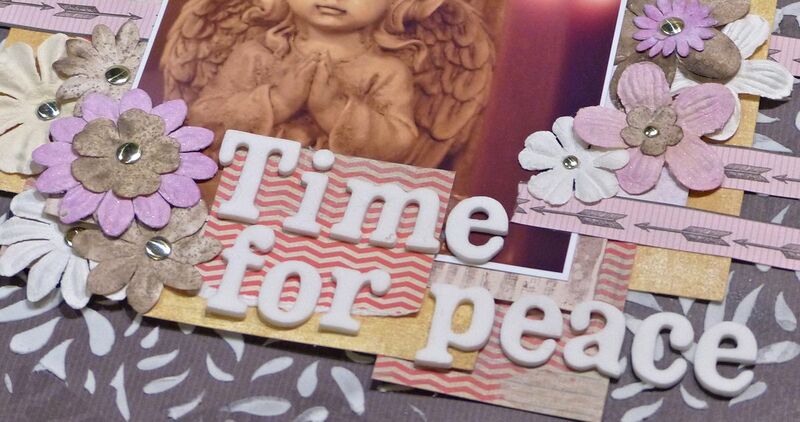 On behalf of the owners and staff of a2z Scrapbooking we would like to wish all a very happy New Year, full of peace, hope, joy, health and prosperity. We look forward to seeing you in the New Year! Without further ado here are some of the submissions from the past year. See you Next year with a brand new challenge. “Hello, it’s Taru here still enjoying Christmas mood. For me, relaxing and being with my family are the most important things about Christmas. This picture in my layout is perfect example about it. To the background I used white modelling paste and a stencil. There is many layers of papers under my layout. Some of the flowers are colored with mists, and I added enamel dots onto the flowers. Remember to use my code TARU15 to get 15% off your total order of $25 if you plan to shop at the a2z Scrapbooking Store today. Our Design Team Call ends at midnight tomorrow. If you would like to be part of a fun, creative team this is your chance to apply. 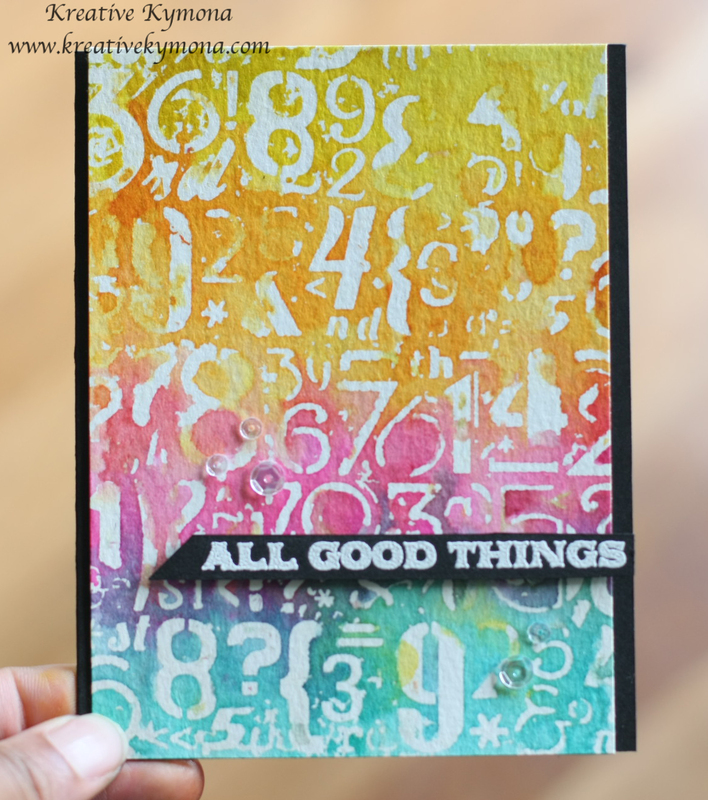 Just click here and link up a favorite card that contains Hero Arts Stamps from you Flickr Stream or Blog. I’m glad you visit here today, thank you! 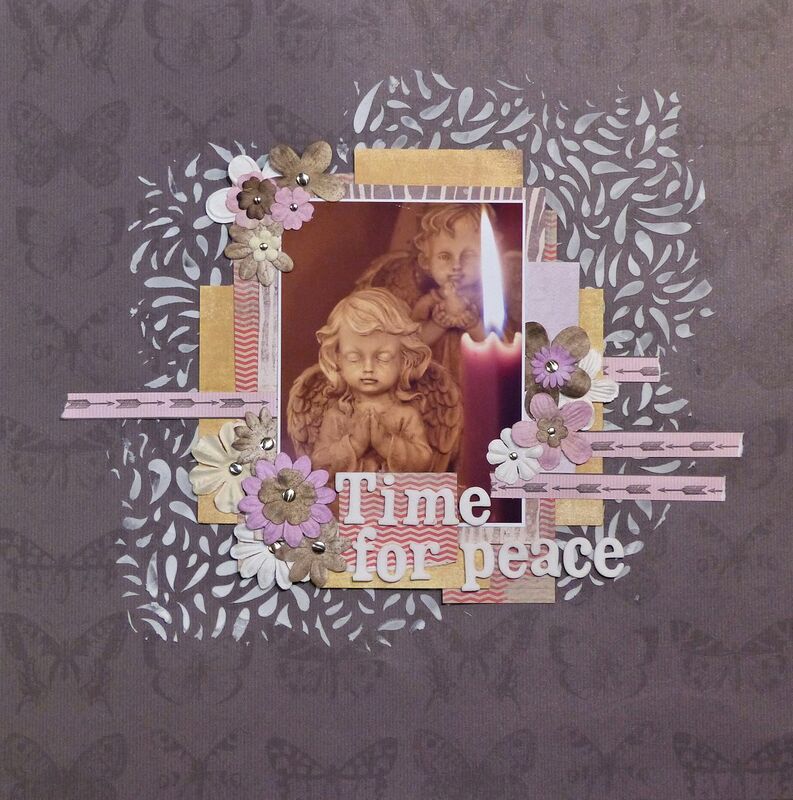 Categories: Scrapbook Layouts | Permalink. Good Morning everyone! It’s Michelle here and today I am going to do something different. I am going to share with you some watercolor cards that I have made throughout 2014. With 2015 coming upon us soon I need to clear out all my photos on my computer to get ready for the next year of pictures. I decided to share some of my favorite watercolor cards from 2014 with you before they head off to my Dropbox vault. This one was a blog post for a2z. You can see the original post HERE and all the supplies are listed there too. 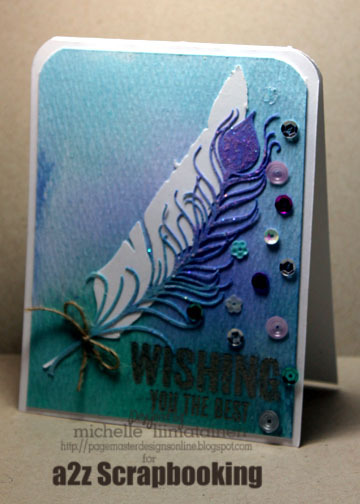 I used a Hero Arts Digital Cut file for the feather. 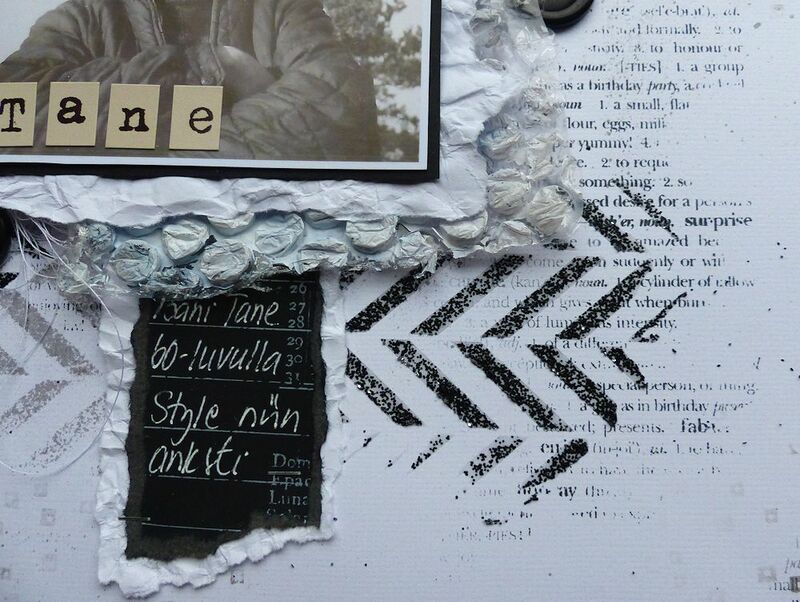 You can purchase that HERE in the a2z Scrapbooking store. This card was posted recently here on a2z Scrapbooking using the “Salt Technique” if you missed it or want to revisit it you can click HERE. All the instructions and products used are linked. 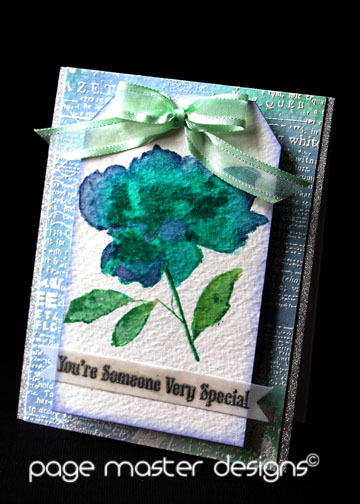 For this card I used one of the Hero Arts watercolor flower stamps. You can find a similar one HERE. If you would like to purchase any of the items used in today’s post you can use the code MICHELLE15 and save 15% off of your purchase of at least $25. 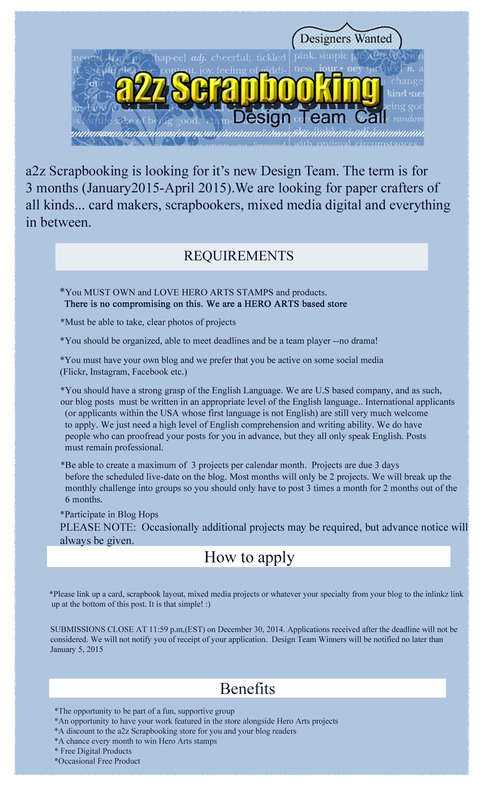 If you are interested in joining our a2z Scrapbooking team we have a Design Team Call out right now. All the information is posted HERE. I wish you all Peace, Joy and Love in the New Year. I can’t wait to see your new creations. 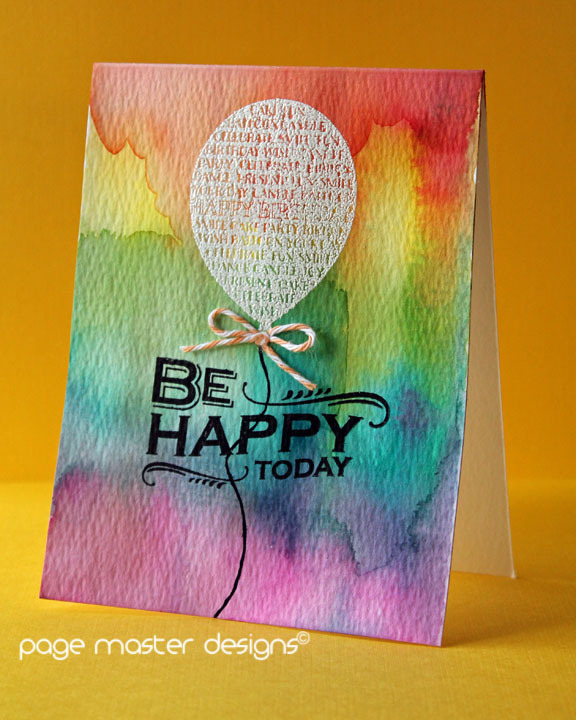 Categories: Challenges, Handmade Cards, Watercolor | Permalink. I love old photos. Lately I’ve found a lot of old photos from my parent’s stash and scanned them to my own use. This is one of them, my father is in the picture. The picture gave me an idea of black&white layout. 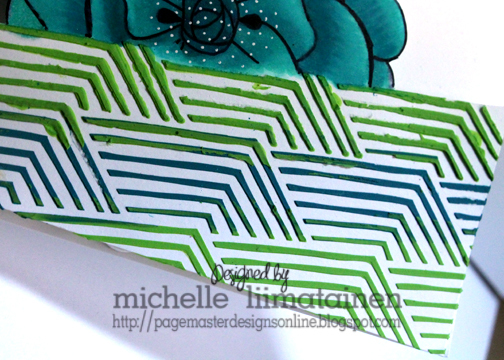 I started with white cardstock, stamped and used masks. Some patterns, texts and arrows to give a nice contrast. I used some old bubble wrap pieces under the photo, there is also a straw as a decorative. 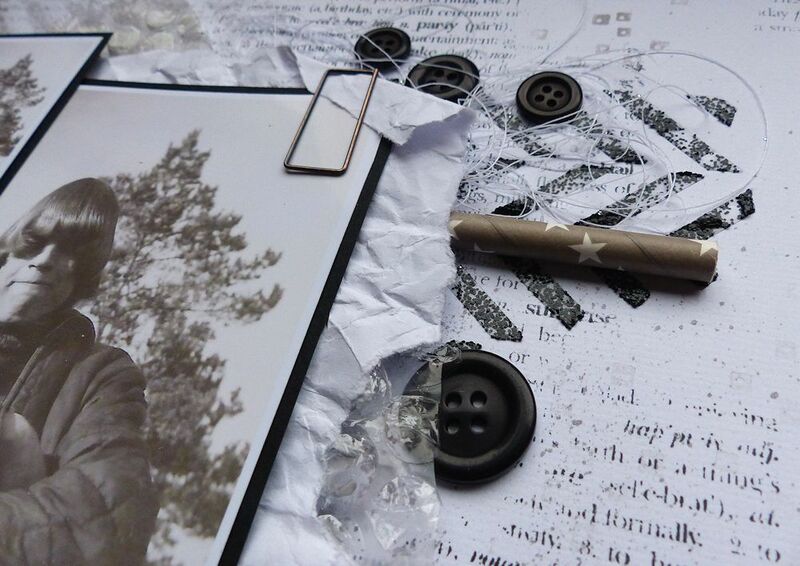 Then lots of thread and buttons. It feels like all my journaling is very short nowadays, how about you? 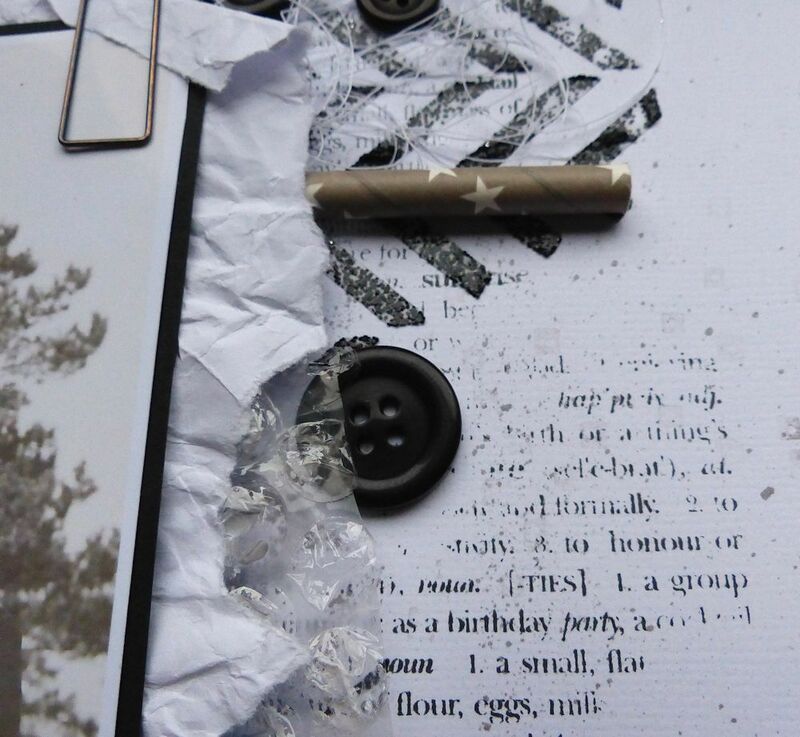 Do you add long journaling to your layouts? Please don’t forget about our monthly challenge going on. You can enter HERE. It’s all about Watercoloring this month. 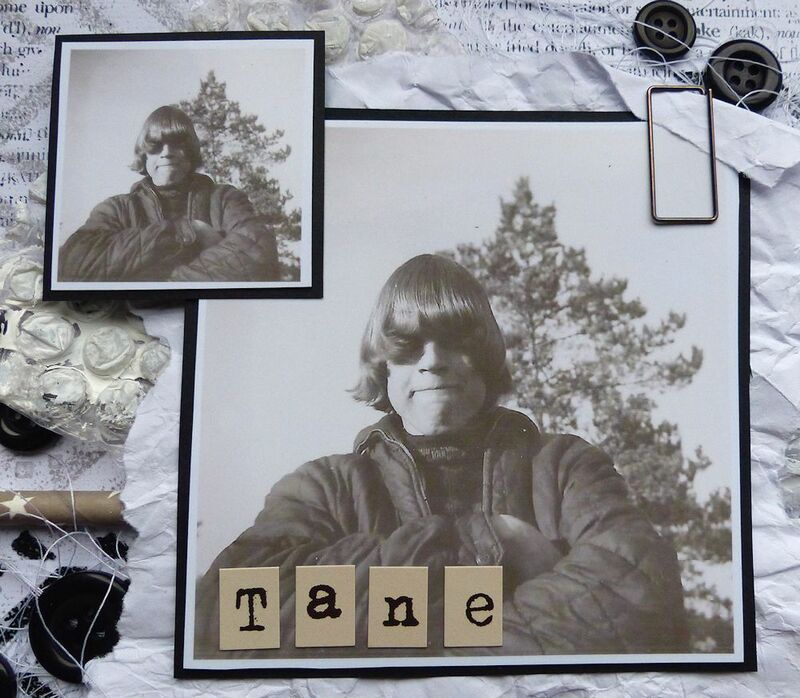 Also, if you would like to purchase items from the a2z Scrapbooking store please use the code TARU15 for 15% off of your order of $25 or more. 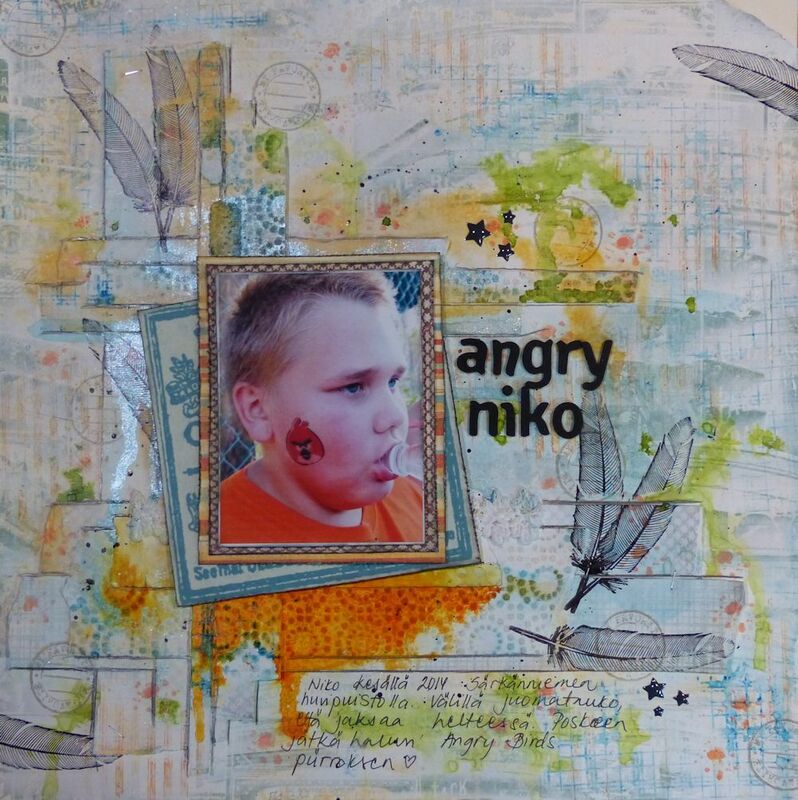 Categories: Mixed Media, Scrapbook Layouts | Permalink. Hello everyone! We are looking to add a few more people to our Design Team. Read below for the details and then link your blog up to the inlinkz below. Good Luck! Hello everyone! It’s Michelle here today. I am filling in for Lisa. Lisa has been dealing with some health issues and had to step down from the Design Team. We will miss her cheerful spirit and her amazing cards. We would like to wish Lisa all the best in the future. Today I am showcasing a card with a technique that I just did for the very first time. While researching water color techniques the other night I came across quite a few videos on YouTube about using Salt with Watercolor. Sounds weird right? The results are anything but…. I started with some watercolor paper and I soaked it pretty good with a brush and some water. 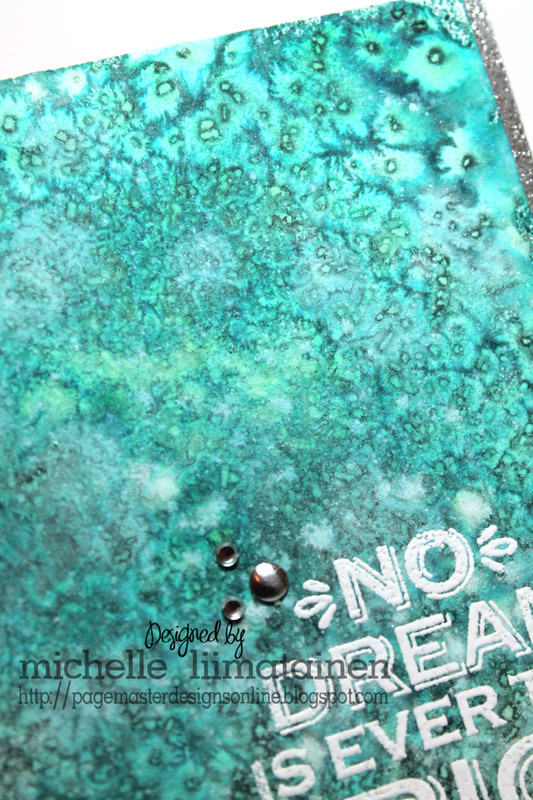 I then used some Hero Arts Tide Pool dauber ink, Hero Arts Silver Spray and some, Hero Arts White Spray to make a big huge colored puddle on my paper. To control the situation I used a card board box lined with some Glad Press & Seal ( seriously a crafters best friend). As the puddles started to form I moved them around and then when I had color everywhere I started sprinkling some COARSE Kosher Salt onto it. You can use Sea Salt too. Notice in the photo below you can see the spots where the coarse salt was. I didn’t stop there either. I added some regular every day table salt into the mix too. You can see where there is less defined detail and more of a marbled look in the photo above. That is where the table salt was. I left both the coarse salt and the table salt on my paper over night. I came back the next morning and brushed it all away and was in awe of the resulting paper. 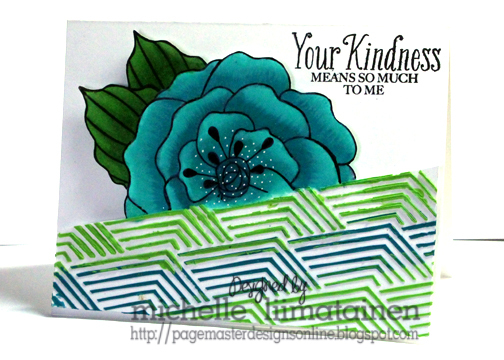 I stamped my sentiment, added some silver strips and attached it all to the front of a card. I did another card with just table salt and the effect was much less. I urge you to try this technique. It’s really fun and so simple to do. 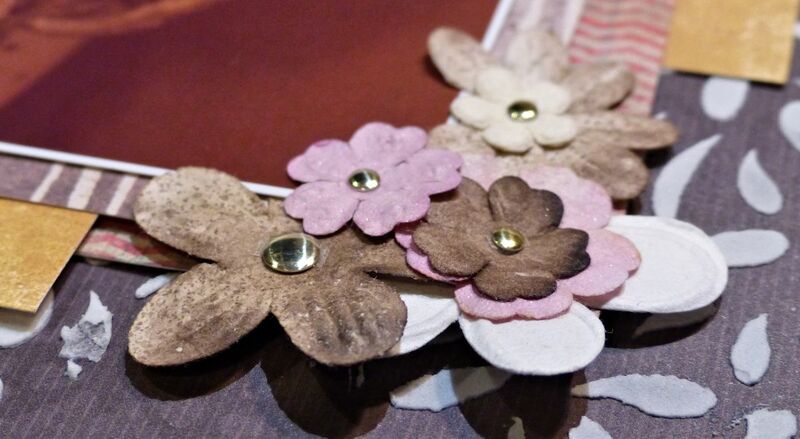 You can use the coupon code MICHELLE15 in the a2z Scrapbooking store to get 15% off of your order of $25 or more if you would like to pick up supplies to try this technique. I have linked them all below. Also, don’t forget to enter our Monthly Challenge going on. It’s all about Watercolor this month. I can’t wait to see what you create. 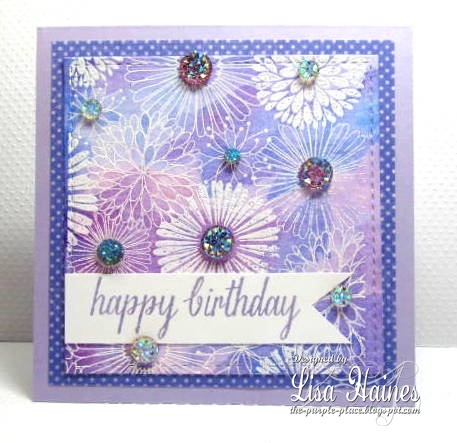 Categories: Watercolor | Tags: birthday cards, card, design team, Heat Embossing, Michelle Liimatainen, Watercolor | Permalink. You have until December 31st to join in. 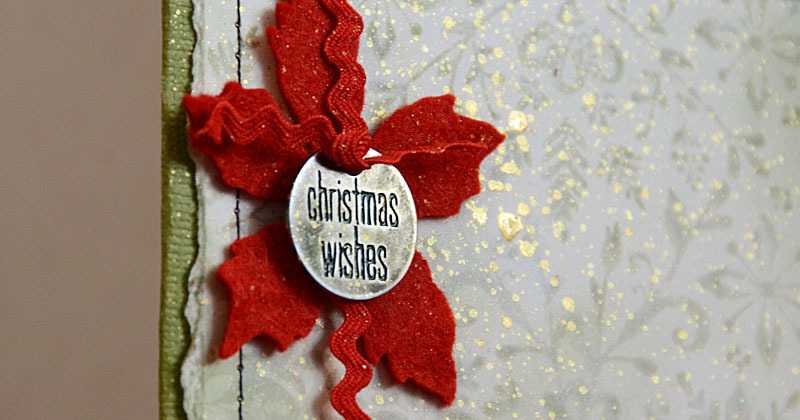 Put some watercolor items on your Christmas Wish List! If you need some inspiration our girls will be here all month to give you that. ALSO….today is CYBER MONDAY and we have a coupon code for you! Just use the code CYBER20 and you will 20% off of your order of $25 or more. Every challenge must have rules. We ask that you please take the time to familiarize yourself with ours. We don’t want there to be any confusion and we don’t want you to have hurt feelings if your project gets deleted. It’s not personal. 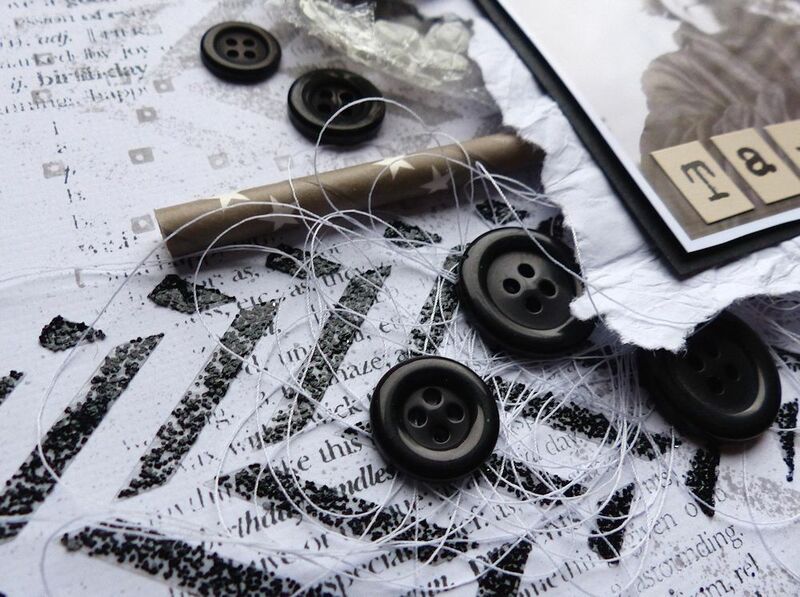 You can use any other product on your project ALONG with the Hero Arts Stamp. 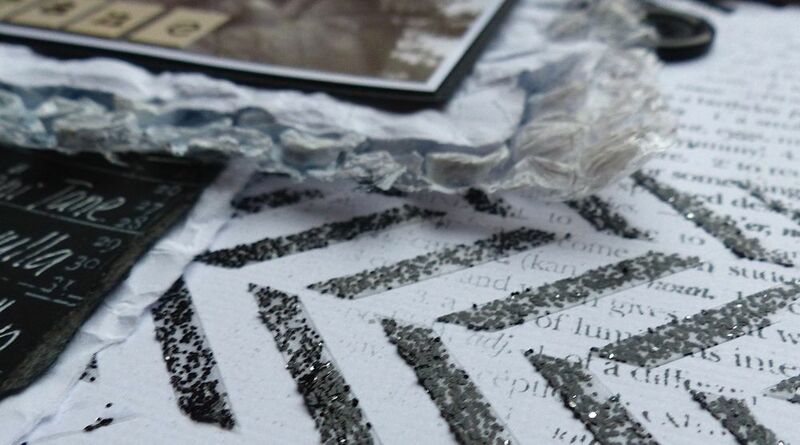 Products don’t have to be bought from a2z Scrapbooking, but we would love it if they were. You can make ANY paper crafting or altered item as long as it has a Hero Arts Stamp and fits within the theme of the challenge. You can enter up to FIVE (5) times per person. Each entry must fit within the theme and each must have a Hero Arts Stamp on it. You can enter your project into other challenges. 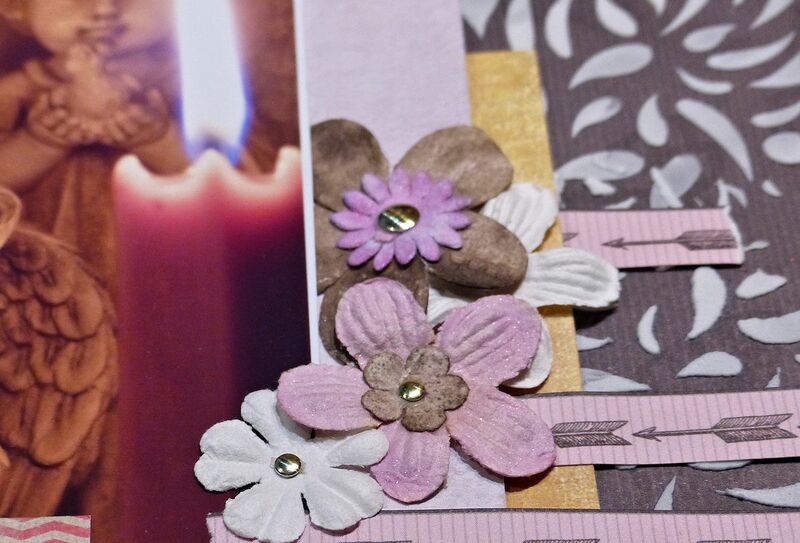 You must mention the challenge in your blog post and link back to a2z Scrapbooking’s Blog/Store. You may link from Flickr, Splitcoaststampers etc. PLEASE respect copyright, do not use images that have been copied without the manufacturer or designer’s consent!! Any entries we find that breach copyright, will be deleted immediately. A new challenge will post on the FIRST of every month. Winners will be chosen based on design, color, and style. Give us your best! Hi Everyone! We are so excited to have a special Guest Designer here today. She is full of talent, tricks and is sweet as can be. Please welcome May Flaum. Hi there, May Flaum (www.craftwithmay.com) here, and I’m gearing up for some serious holiday crafting. 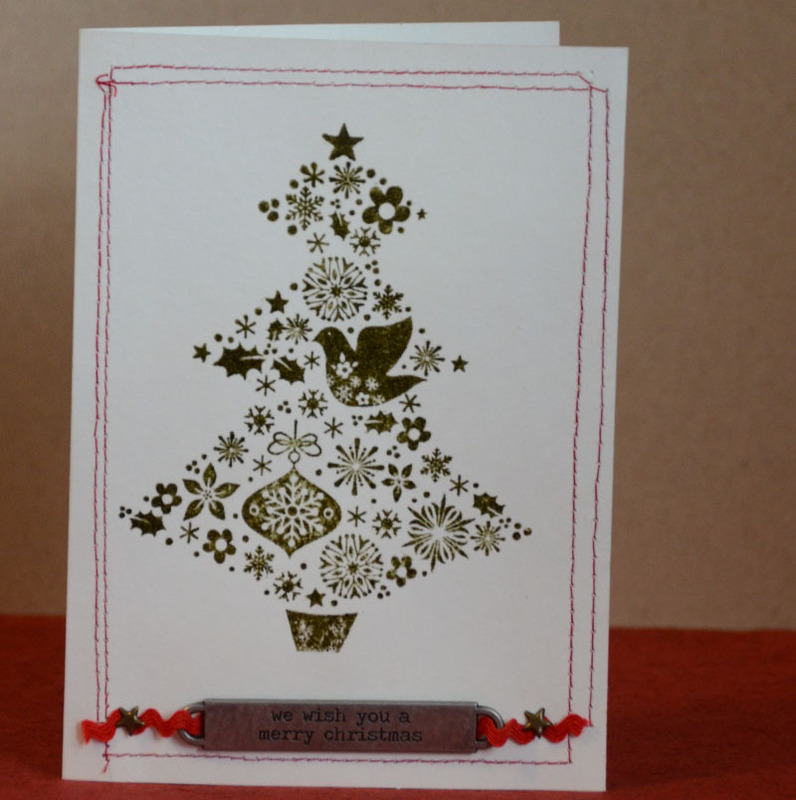 One of the challenges I always face is finding fun ways to use my holiday stamps on cards and tags that doesn’t require a ton of time or supplies. Today I’ve got two cards to share with you. This first card is simple enough. 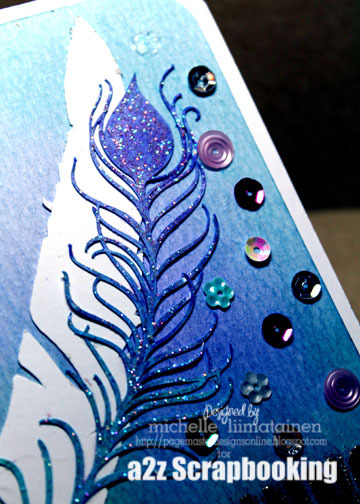 You’re going to stamp a background stamp onto white cardstock and then blend in some subtle color. 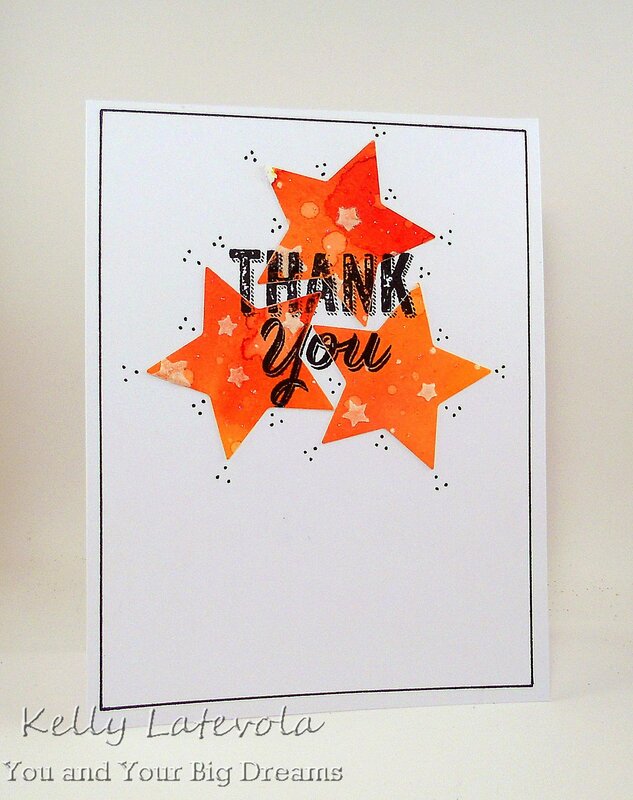 I used a fabulous Hero Arts stamp for this, and I love the results when I use distress ink! It allows for a soft watercolor effect, lets me play with my supplies, and is done in moments. 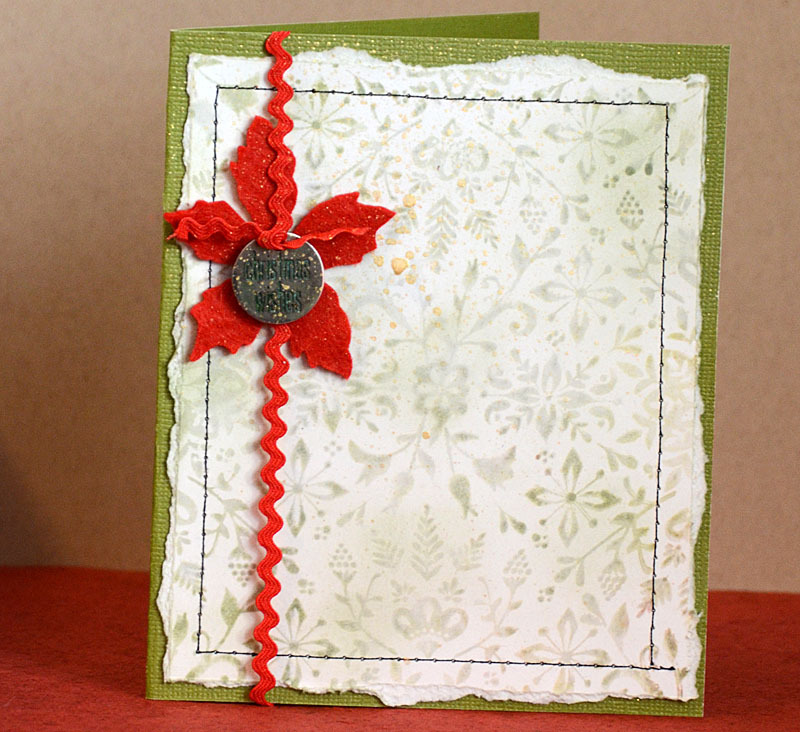 Once dry I assembled my card along with a little flower, metal accent, and some leftover trim. 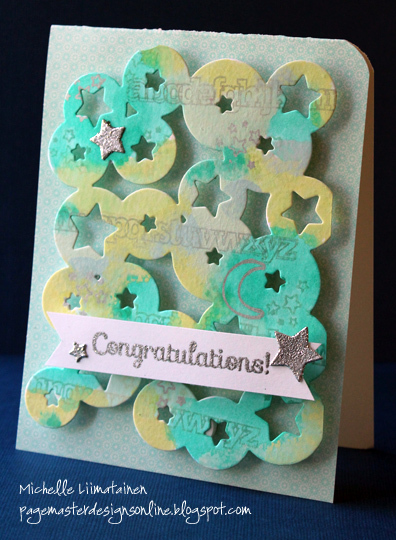 You could substitute in a sticker, die cut, or any accents you’ve got for this design! For my next card, I stitched all around the edges (twice), and attached a metal word band with some brads, but again the real star is the stamp. 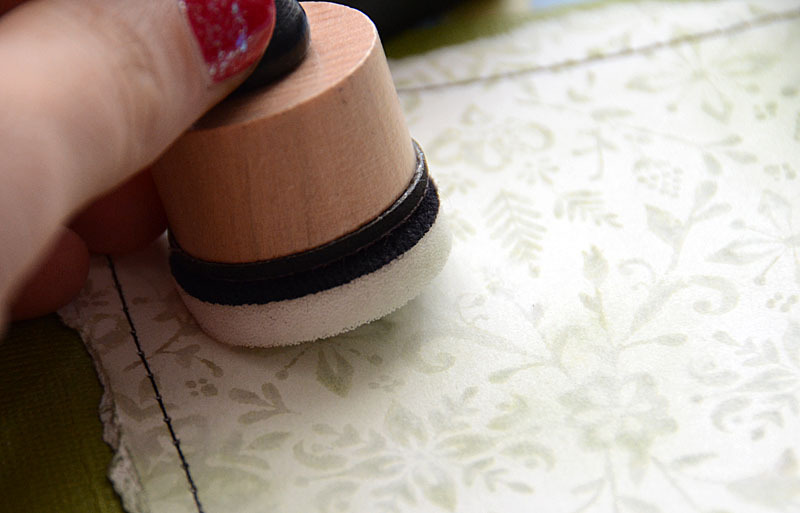 While this stamp seemed easy, I’ve actually had a tough time using it! 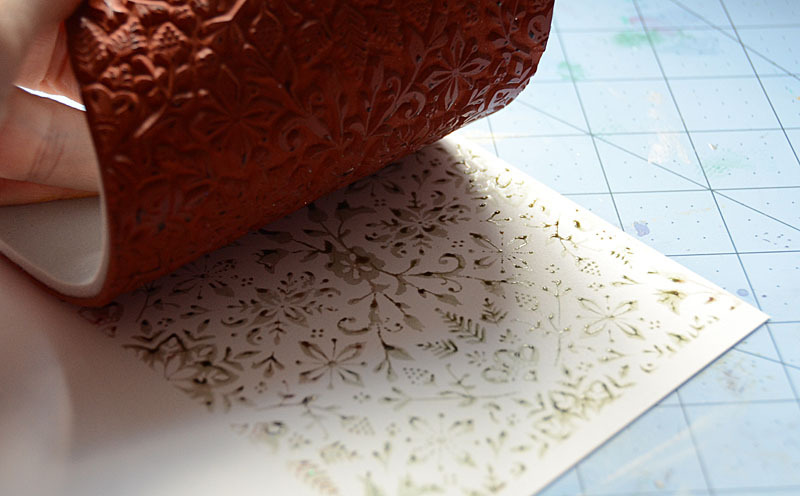 The thing is the design is so intricate, and so beautiful, it really does not need a lot of fuss! 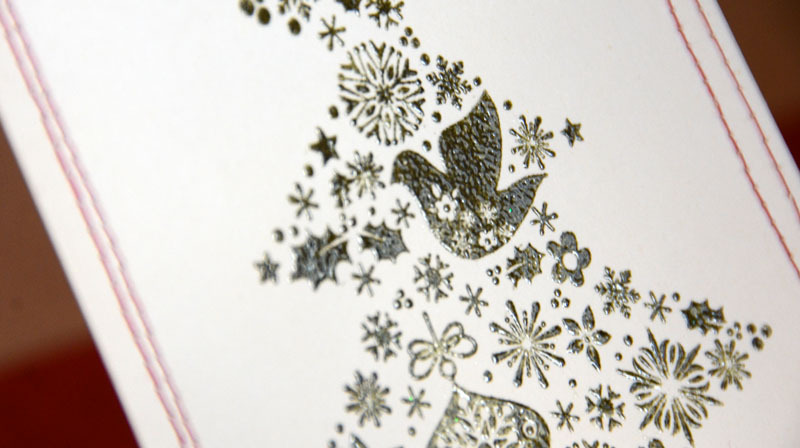 Color with one (or more) ink colors, clear emboss over to add some shine and dimension, and let it speak for itself! Thank you so much May. We really appreciate you taking the time to come by and share you genius with us.